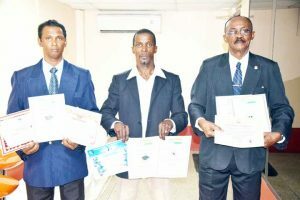 Not classified as one of the mainstream sports in Guyana, Martial Arts, however, received a significant boost recently when three members of the Guyana Martial Arts Masters Association (GMAMA) received accreditation to confer doctorates on practitioners. The three high ranking Masters pose for a photo op with their certificates of excellence last Friday. The International Fellowship of Martial Arts (IFOMA) sent a document to GMAA founders Drs. Christopher Norville (9th Dan), Kazim Yassim (10th Dan) and Eustace Cuffy (9th Dan) allowing them to bestow on martial artists a doctorate in martial arts. The three high ranking officials visited Kaieteur Sport last Friday to highlight the achievement and to serve notice of the Guyana’s growing reputation in the sport. Dr. Norville, who is the current President of the GMAMA in his comments, said that the sport has enjoyed admirable growth over the past few years and this expansion according to him has been one of the factors prompting recognition and certification worldwide. Dr. Norville added that Guyana’s growing reputation in the sport has attracted attention internationally with local martial artists performing with distinction at regional and international engagements and the recent bestowal is testimony of the high regard in which the country’s progress is held. The 9th Dan Dr. Norville is one of two experts in the Fudo-Shin Ju-Jitsu style along with Dr. Cuffy. Dr. Yassim, at whose Onderneeming, West Bank Demerara location the school currently operates is no stranger to the sport and is someone who has a big reputation for churning out high achievers. A founder / Grandmaster of the Shin-Kai-Ryu and Kyo-Kushiri-Kai Academies, Dr. Yassim told this newspaper that it is their wish to have the Guyana flag flying high internationally and more recognisable locally. Dr. Cuffy, who is the General Secretary of the GMAMA, revealed to Kaieteur Sport that he is also very proficient in the kick boxing art and has held many positions in other disciplines as well. The three members were high in praise of the support and guidance offered by Grandmasters Professor Medhi Javadi Ranjbar of Iran, Dr. Niranjan Bath of India and Dr. Nowieldath Khedoie of Suriname. Meanwhile, the GMAMA is planning to host its 4th Annual Hall of Fame and Awards Ceremony next year. Dr. Yassim said a Masters and Grandmasters Championship is also being looked at and the intention is to invite prominent martial artists to come and compete here. Caption- The three high ranking Masters pose for a photo op with their certificates of excellence last Friday. Photos of: Grandmaster Dr. Niranjan Bath and Prof. Medhi Javadi Ranjbar.